Prof. Kolapo Olusola, Deputy Governor of Ekiti State, and governorship candidate of the Peoples Democratic Party (PDP) in the July 14 gubernatorial poll in Ekiti State, on Friday, submitted over 700 pages of petition to the election Tribunal in Ado-Ekiti, the Ekiti State capital, alleging ballot box stuffing, snatching, use of security forces to manipulate electoral process and gross falsification of results. While submitting the petition at about 5:30p.m. on Friday, Eleka said: ” Today, I formally filed the much expected petition against the results of the July 14, 2018 governorship election, which was openly manipulated by political desperadoes, using instruments of the Federal Government. “Like I have maintained, I am challenging the election results not out of desperation to be governor, but for reasons of future and posterity, and largely on behalf of the people of Ekiti, who were taken aback by the outcome of the election. “Without doubt, the will of the people was subverted by those who have chosen to take Nigeria back to the dark days of ballot stuffing, ballot boxes snatching and outright falsification of election results and I believe they deserve to get justice. “As law-abiding citizen of our country, the only path of honour to take in a situation like this is the process that we have initiated today, to seek redress against the use of security forces and other instruments of the Federal Government to suppress the will of our people. “Sadly, the desperation of the APC to take over all states in the country, especially those under governors like Dr. Ayodele Fayose, perceived as uncompromising, has destroyed all the gains made by the PDP government regarding free, fair and credible elections. “The mood of Ekiti people when the beneficiary of the electoral robbery was declared winner and up till today is a pointer to the resolve of the people not to accept the subversion of their will and we have answered their calls to use the judiciary to get back their mandate. “ln doing this, we have presented overwhelming discrepancies in the results declared by INEC to the tribunal to adjudicate upon and I am confident that the popular mandate of the people of Ekiti will not go un-restored. 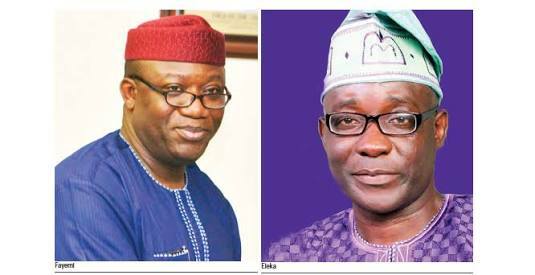 “I therefore want Ekiti people to keep hope alive, remain strong and resolute in their belief in God. “I also want to use this opportunity to condemn the indefinite closure of the State Radio and Television stations. “No doubt, the closure of the radio and television stations was part of the grand plan to sustain the inglorious use of Unclad force to rob Ekiti people of their democratic rights, but the people will triumph ultimately,” he said.